Trade shows are a key part of marketing and sales efforts for businesses in every industry. But with the sheer number of booths set up at trade shows, how can you ensure that your booth stands out and attracts attendees? Like all facets of business, trade show demonstrations can be enhanced with the use of AV technology and video content. 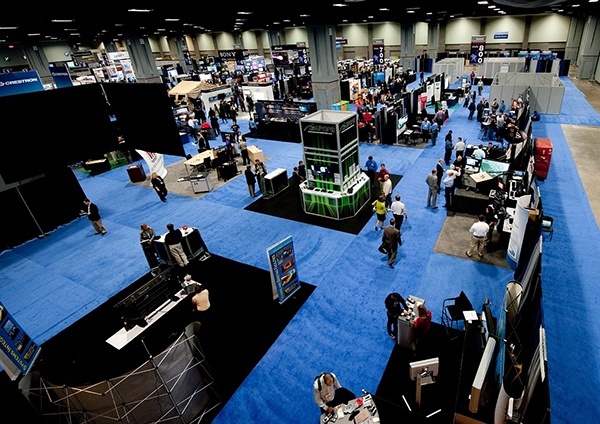 On average, trade show attendees spend over eight hours filtering in and out of various booths. While eight hours may seem like a substantial amount of time, large trade shows often have over 800 exhibitors. This means your booth has to stand out to attendees in order to retain their attention. AV technology is the best way to attract attendees at trade shows. With so many AV technologies available, it’s easy to get beyond the typical print backdrops and signage in order to stand out in a sea of similar booths. By using digital signage, enhanced video backdrops, and custom video content, your booth will become more attractive to attendees while simultaneously looking more professional. Utilizing video in a trade show setting is an effective way to assure the biggest ROI. By using video in multiple ways—as a backdrop, as an accent, or as branding mechanism—your company’s booth will gain traction with attendees. In today’s technological world, a large 4K monitor with custom content will instantly capture the attention of passersby. Once video captures their attention, it also has the ability to tell the story of a product or company. Trade show attendees want to be enticed and captivated by booths, and video is an effective technology in doing both—but there are also other ways to attract attention via AV tech. Virtual reality, interactive kiosks, and mobile connectivity in a booth allows attendees to have custom experiences, which are often welcomed after visiting booths that are all utilizing the same technology. Interactive features at booths allow companies to create engaging, informative content around products or services. Just using AV technology in a trade show isn’t enough to be successful. Rather, combining AV technology with the correct implementation and strategies is the key to success. In terms of strategy, make sure to utilize AV tech to tell a brand’s story so attendees will be more likely to see value in the product. When it comes to implementation, don’t overlook the importance of lighting. Layered lighting can direct attendees’ eyes – and feet - to strategic areas of the booth. By lighting up logos, new products, and other important booth attributes, you can highlight important information for trade show attendees. Setting up a technology-filled booth correctly is a vital part of your trade show success, more important is knowing how to plan the use of AV technology. So, with the AV contractor in charge of vital parts of your displays at trade shows, how do you choose the most qualified contractor? There are many factors to examine while choosing an AV contractor, but some are more important than others. For example, experience matters. Your AV Production Partner needs to be experienced not only in a trade show setting but also with designing the use of technology for trade shows. Examine potential vendors’ reputations carefully, searching for reviews of strengths and weaknesses. Make certain that they take time to understand your objectives and offer options, because there’s always more than one way to get results. Perhaps the most crucial factor in choosing an AV contractor, though, is their vision. By having a shared vision with the contractor in regards to your booth, you and your contractor will be working together at a shared goal, making the process less stressful for the both of you. Trade shows are an excellent way to gain exposure for your product or company. With the use of AV technology such as video, digital signage, virtual reality, and more, you can ensure the exposure is positive. But choosing the right AV technology to best compliment your vision is only half the challenge. Finding an AV Production Partner with the necessary experience and certifications is also a vital part of guaranteeing the greatest ROI from your trade show investment. With the use of AV tech implemented by the right provider, you will be able to maximize the results of your next trade show experience. If you are in the market for a partner to help with your next live event or trade show, check out what we, at HB Live, Inc., have to offer. We would love the opportunity to sit down with you and discuss how we can help meet your needs and create your vision. See how our Live Event Production Services can help you attract visitors to your booth.